India’s leading car-manufacturer Maruti Suzuki has plans to release Maruti Ciaz Hybrid in India this month. 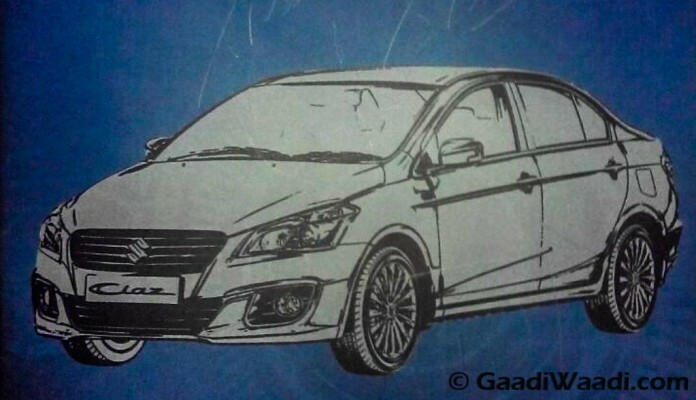 Friends at GaadiWaadi.com have reported that they have exclusive details on upcoming Maruti Ciaz Hybrid. The new Hybrid Ciaz is just not about idle-start-stop system, but also comes with electric engines as well as electric batteries. The upcoming Ciaz hybrid is expected to be first launched with the diesel engine variant first. Ciaz comes with more improvised mileage – 26.2 Kmpl. The new V(O) variant of Maruti Suzuki Ciaz is expected to get ABS (Anti-lock braking system) and EBD as standard from this variant onwards till the Z+. The new highlight is that Maruti is adding EBD to Maruti Ciaz. Second big news is that Maruti Suzuki Ciaz Hybrid and all other Ciaz variants would get Driver airbag standard across the variant. However the ABS and EBD feature would not be present on standard V variant of Maruti Suzuki Ciaz. The safety of Maruti Suzuki Ciaz is also enhanced in this variant. GaadiWaadi.com reports the Ciaz would also be showcased at the NEXA dealership as an eco-friendly car for customers who are more environment conscious.